Limited Time Offer - Free Case of Code: Green "All-in-One" Cleaning Agent. $111.80 Value. Hurry, this offer expires soon! Best Portable Extractor - Carpet Cleaning Machine with Truck Mount Power! 13 Gal. Solution / 15 Gal. Recovery Tanks - 3 & 4 Vacuum Motor Models! The Eclipse has power impossible to find in other Portable Extractors, and even hard to get in many Truck Mounts. This is an amazing carpet cleaning machine. Carpet cleaning equipment at it's best! 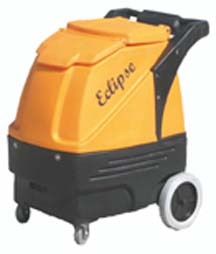 The Eclipse portable carpet cleaning machine offers models with 3 and 4 vacuum motors that produce 249” Water-Lift (3 Vac Model) and even 340” Water-Lift (4 Vac Model). Your choice of 220psi or Adjustable 0-500 psi pumps, Dual Heating Systems, and other Auto Options make the Eclipse the right choice for any person or company looking for a new extractor. The next generation of High-Powered Portable Extractors is here. CleanCraft's Eclipse is a machine like no other. Whether you are currently using another portable unit or a truck mount, you will not believe the power of this unit! Not only does the Eclipse provide power, but it also has features, components, and the look that makes this unit stand above all others. The above video is about 15-minutes, but worth the watch! It goes over all the cool features and reasons why to choose the Eclipse! Dual Heating System - Models available with two Heating Elements allow continuous heating of Solution. Plus, 2 Heater Switches allows you to turn off half the heater in homes with bad circuitry (i.e. old homes). This allows you to at least run half the heater instead of no heater at all, unlike other machines. ReRoute By-Pass TechnologyTM - The 1st and only extractor on the market to have this built-in technology! See below for more information & our video on this exiting new technology. Slide-Out Tray - Easy Access for repairs. All the "Guts" of the machine slide out right in front of you. Dump Hose - Rather than having a dump valve that will start to leak over time (like other units), the Dump Hose allows easy dumping right into a 5 gallon bucket or toilet. Circuit Indicator Light - A light turns on to indicate your are on separate circuits. Helps prevents popped circuits. 25ft Hoses - We give you 25ft of high quality, crush-proof vacuum hose and 3000psi rated solution hose included with the Eclipse. Many suppliers only give you low quality & pressure hoses. As a side note: Our Eclipse can run up to a 100ft of hose! Heavy Duty, Non-Marking Rear Wheels - The Eclipse's wheels were improved with heavy duty 10in wheels that provide extra strength and maneuverability. Taller Base - The bottom black base portion of the Eclipse is now made 2in taller to provide easier slide-out access of the tray. 4-Fan Forced Venting System - The Eclipse goes beyond just vents (like other machines) to keep the inner working area cool. We use technology for everything... our 4-Fan forced venting system blows cooler air in and hotter air out of the inner working area of the Eclipse. Cooler working atmosphere for components can equal longer part life! Smarter Build Components - We redesigned the inside guts of the Eclipse for easy "Swapping" of parts. Items like "quick release" electrical components, wing nuts on the relay protector, and redesign of mounting brackets for quick removal and replacement of vacuum motors make the Eclipse even easier to service and maintain. Rapid Connect Auto Features - You can now purchase Auto Fill/Chemical Feed and Auto Dump options "after market." The Eclipse Rapid Connect Auto options allow you to just "Snap" the auto features right on to the Eclipse. Now you can fully automate your machine on big commercial jobs! (See Product Accessories down below for more information on these separate accessories). Online Video Commercial - When you purchase the Eclipse, you get the opportunity to add this 3-minute Online Video Commercial to your website! You have heard that a picture is worth a thousand words. Well, this video is worth a million. It was designed to communicate why potential customers visiting your website should choose your company for carpet & upholstery cleaning. Imagine the benefits of having this commercial on your website: Professional image, Effective visual communication, Highlights the main selling points of your service. This video can help your business grow! More details on how you can use this video are listed here: Online Video Commercial Page. The Eclipse has been one of the industry leading professional extractors for over a decade. Always in the forefront of design and technology, CleanCraft has done it again with the Eclipse. The Eclipse is the 1st and ONLY extractor on the market to offer ReRoute By-Pass TechnologyTM. This exciting new technology reroutes the internal plumbing of your machine in an instant, if there is ever a problem with your pump, heater, water lines, etc. Think of it as a built-in safeguard to prevent you from ever being in the position to cancel jobs, because your machine is out of commission. Remember, eventually, every machine’s pump will go down, it is just a matter of time. With the Eclipse’s built-in ReRoute By-Pass TechnologyTM, you will never be in a position of cancelling work, losing money, and creating angry customers. Remember, the Eclipse is now built standard with the ReRoute By-Pass TechnologyTM. To take advantage of this technology, you will need to get the Eclipse By-Pass Pump BoxTM accessory. Watch the Eclipse ReRoute By-Pass video below! Also, see the Eclipse By-Pass Pump Box under "Product Accessories." Save $50.00 when you purchase the Eclipse By-Pass Pump BoxTM at the same time you are buying the Eclipse extractor. See the checkbox above under "Portable Options." Market a "Green" image with your company. Using the Eclipse & Code:Green can put a "Green" marketing edge to your company. Here is an example of how one of our customers uses the "Green" advantages of the Eclipse & Code:Green to work to his company's benefit. (Reported by Courtney Dunn, WBOY-TV). Rapid Connect Auto Dump - No stopping to empty. Automatically dump your dirty water while cleaning. Snaps right on to your Eclipse. Rapid Connect Auto Fill/Chemical Feed - No stopping to fill water & chemical. Supply your Eclipse with cleaning solution by automatically ratioing water & chemical right into the solution tank while you clean. Eclipse By-Pass Pump Box - See video above on this! 2 Cord Systems: Heated models require at least one 20amp circuit. Grow Business Guarantee: See our Online Video Commercial Page for usage guidelines and for guarantee information. Eclipse By-Pass Pump Box is an added accessory purchase in order to take advantage of the built-in ReRoute By-Pass TechnologyTM that comes standard in the Eclipse. Love this machine! Great suction, functionality, and easy to use. Lightweight enough for me to lower it out of my vehicle by myself yet very durable. I would highly recommend this portable extractor. I bought my Eclipse a little over a year ago and I have been using it to make my customers' carpet look incredible. I also clean ceramic tile and grout and use the Eclipse to extract the water. I believe it is better than a truck mount cleaner. I take my Eclipse in high rise condos where truck mounts can't go. It has three vacuum motors and the water lift is awesome. If you take care of your machine you can earn lots of money using the customer's electricity and water. I am so happy to have my Eclipse.